The Cicero: A LEGAMUS Transitional Reader contains 103 lines from Cicero's Pro Archia. Innovative text combines special visual features—including line alignments based on meaning with the "pass through" method—to unpack Cicero's complex prose. Copious notes and reader aids along with facing vocabulary make this text an excellent introduction to Cicero and smoothes the way for upper level Latin reading. Resources include an introduction to Cicero, bibliography, grammatical appendix, figures of speech appendix, and a pullout vocabulary. Selections (103 lines) from Pro Archia: 4.2-4, 5.1-3, 5.4-6, 6.1, 6.2-3, 7.1-3, 12 entire, 13.1, 14.1-3, 18.4-5, 19 entire, 23 entire, 24.1-3, 28 entire, 29 entire, 31 entire, 1 entire, 2 entire, and 3 entire. "pass through" approach that begins with the main statement and adds clauses with each "pass"
All the education in the world may not be preparation enough for the real thing. "Cicero A Legamus Transitional Reader" is a guide to help students of Latin make the leap from the their Latin classes and text books to actual Latin documents and books. Professors of the classics in Mark Haynes and Judith Sebesta hope to help readers gain a greater grasp of the details of Latin and its grammar rules that are not commonly taught in most textbooks. 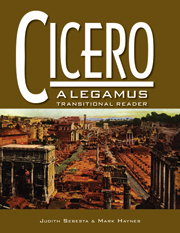 "Cicero A Legamus Transitional Reader" is a fine pick for any Latin enthusiast, be they professional or amateur.